If you’re coming down with the January blues after a fun-filled (and expensive!) Christmas period, we have the perfect remedy for you. The team at Bucky Bingo have decided to keep the festive cheer and generosity going well into the new year with their January Value promotion. Head over to the site on the promotional times and dates and you’ll find bingo games jam-packed with extra value and tickets going for incredibly low prices. Sound good? Read on for more information. January Value is about as generous as it gets for bingo lovers. Here you’ll find a whole heap of tickets for high-value games going for reduced prices. In some cases, the tickets on offer have been slashed to a whopping half price! To take advantage of these cut-price tickets, make sure you’re in Bucky Bingo’s Big Money Room between 6pm and midnight, Monday to Thursday. The promotion will run until January 31st and is open to all customers, so even if you haven’t signed up for the site yet, there’s still plenty of time. 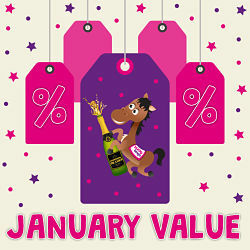 All registered members of Bucky Bingo are welcome to enjoy the January Value promotion. However, the website reserves the right to refuse the promotion to any player who they deem to be abusing the offer in any way. Please note that the discounted tickets are only eligible for the Big Money Room on the promotional times and dates specified above. Game-play outside of these times or in any other room will not qualify as part of the January Value promotion.